For years there have been fears that the Taliban were gaining ground in Pakistan's commercial capital, the port city of Karachi. There is now evidence that the militants' influence in the city has hit alarming new levels, reports the BBC's Ahmed Wali Mujeeb. 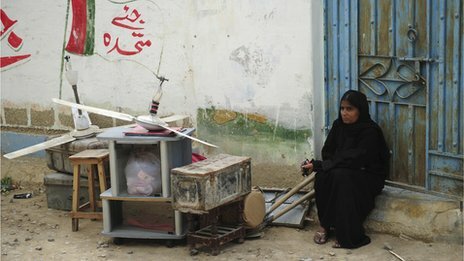 More than 20 people are gathered outside a ramshackle house in a suburb of Karachi - Pakistan's largest city. They say a plot of land, which was the property of a local businessman, was forcibly occupied by a local mafia last September, and they are here to complain. The difference now - and a source of much alarm to those in the know - is that this group of Karachi residents are choosing to bring their complaint to the Taliban. After a two-hour session, the Taliban judge adjourns the hearing to another date and venue which he says will be disclosed shortly before the hearing. This mobile Taliban court does not limit its interests to this one shanty town on the outskirts of Karachi. It has been arbitrating disputes across many suburbs in the metropolis. The Taliban largely emerged in poor areas on the fringes of the city, run-down places with little or no infrastructure for health, education and civic amenities. Their mobile courts have been hearing complaints for quite some time, but in recent months they have also started administering punishments - a sign of their growing clout. In January, they publicly administered lashes to an alleged thief after recovering stolen goods from him. The goods were returned to the owner who had reported the theft. But the picture is complicated. 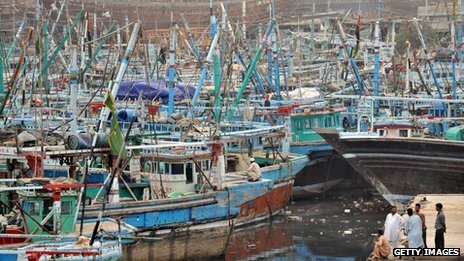 There is a tussle under way between mafia groups (becoming more prolific and powerful in Karachi) who seek to seize land and militant groups who are also grabbing land. This includes the Taliban, for all their willingness to arbitrate in these disputes. It is clear that they want to tighten their grip in Pakistan's biggest city, its commercial centre. And they appear to have great influence in those suburbs dominated by the Pashtun ethnic group. These include many of the districts on the edge of the highways and roads leading to neighbouring Balochistan province. They have long had a power base in the north-west of the country but this entry into Karachi is a more recent phenomenon. Districts East and West in Karachi, with shops and street stalls selling chapli kebabs, fruit, sweets and clothes, have a very traditional Pashtun feel. Many people earn their money as day labourers with a daily wage. They work in construction and in factories. Their income level varies from 7,000 rupees per month ($71; £48) to 20,000 rupees per month. Pashtuns have been here since before the creation of Pakistan in 1947, but a major influx began in the 1960s. After the Afghan war of 1979 and military action in recent years in Swat and Waziristan, many more came. There are many slum homes with poor infrastructure, amenities and low literacy rates. People here express fears about "bias" on the part of the local administration towards this area and many attribute the area's poverty to such perceived attitudes. Indeed while impromptu Taliban courts are increasingly settling small disputes over property, financial theft, robberies and feuds in Karachi, residents say major issues are decided in Pakistan's northern tribal areas - where Taliban strongholds abound. And when they think their authority is being encroached on, they act with deadly force: The MQM lawmaker Syed Manzar Imam was killed by Taliban gunmen in January in Orangi town, which borders a Pashtun area. One former leader of the Awami National Party (ANP) - a party of the ethnic Pashtun nationalists - recently left Karachi and said more than 25 of his party offices had been forced to close because of threats from the Taliban. A senior police officer who does not wish to be named told me simply: "Taliban are swiftly extending their influence. "There needs to be a strategy to stem the Taliban's rise, otherwise the city will lose other important and central parts to them," he says. Muhammad Usman is a 26-year-old Taliban commander from the Swat valley. He came to Karachi after the Pakistani army started an operation in Swat in 2009. He says he was first part of a group of Swati Taliban in Karachi and was offered shelter and safety by them. After some time, he gradually got involved in what he calls "eliminating rivals" in the city. When questioned about extortion and kidnappings done in the name of the Taliban, he said there were several criminal gangs involved and that the Taliban were trying to put them out of business. But the response of the public is the ultimate test for them. One resident of Kanwari Colony, Muhammad Yousuf Mehsud, says: "I do not know about the Taliban's presence in the locality, however if they come here I will welcome them." Another, a 45-year-old resident in Landhi, Haji Afridi, says: "The Taliban have created discontent amongst Pashtuns." He says that every Pashtun trader is threatened with extortion by the Taliban and whoever refuses to pay is killed. "The police are scared of the Taliban and are therefore reluctant to take action against them," he adds. A 25-year-old Taliban foot soldier, who identified himself as Hussain, describes his mission in Karachi and his comments highlight the nature of the violence that has riven the city. "First, my task was to work with groups that sought to eliminate members of the ANP party and people who spied for the police. I am now in a group that is fighting the MQM activists." 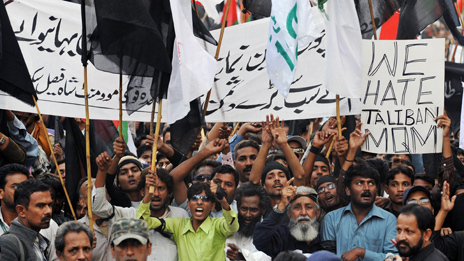 The MQM, which is the dominant political party in the city, was one of the first groups to voice concern over the growing Taliban presence in Karachi. But Karachi's ethnic and political landscape is complex. The city has long suffered outbreaks of violence, some of which is down to militancy, but the bloodshed is also about turf wars between rival ethnic and indeed political groups. In recent years the Pashtun community in the city has grown, and they are seen as competition for land and jobs with the Urdu-speaking community. The MQM has long argued that there is a link between the growth of the Pashtun community and the "Talibanisation" of the city. But there have also been separate battles over turf between the city's Baloch community - the original inhabitants of the city - and the MQM. This violence also makes itself felt politically and there is profound antagonism between the local chapters of three political parties: the Pakistan People's Party (PPP), the mostly Pashtun Awami National Party (ANP) and the Muttahida Quami Movement (MQM). So while many point to the increasing presence of the Taliban, the rate of targeted killings and spontaneous confrontations between supporters of these rival ethnic and political groups has not let up either. Intelligence sources say that there is one Taliban chief for the city, and heads of groups operating in different areas answer to him. "Though the government has expressed its resolve to eradicate militancy, other state institutions are not co-operating," analyst Professor Tauseed Ahmed Khan says. He argues that the security forces are losing morale when it comes to the battle against the militant groups and adds that this is not improved when rebels find it easy to get released on bail by the courts. Prof Khan says that if the government fails to recognise the threat, the city will descend into chaos. But Sindh Information Minister Sharjeel Inaam Memon says the government is planning an operation to clamp down on the Taliban. He adds that the government has already arrested a large number of militants. 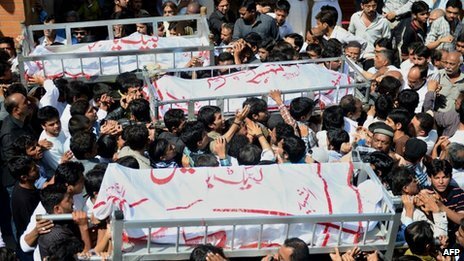 The figures are sobering: at least 2,350 people were killed in violence in Karachi in 2012. Over the last six years, more than 6,000 people were killed, say police.